Democrat Cheryl LaFleur is a former utility exec who has expressed concern over FERC’s previous orders opening up market competition. The Federal Energy Regulatory Commission isn’t a big target of the Trump administration, in terms of major budget cuts or wholesale policy shifts away from climate change and clean energy. But it’s still an important player in federal energy policy, and the president’s choice of its leader can have a significant effect on how it approaches its job. 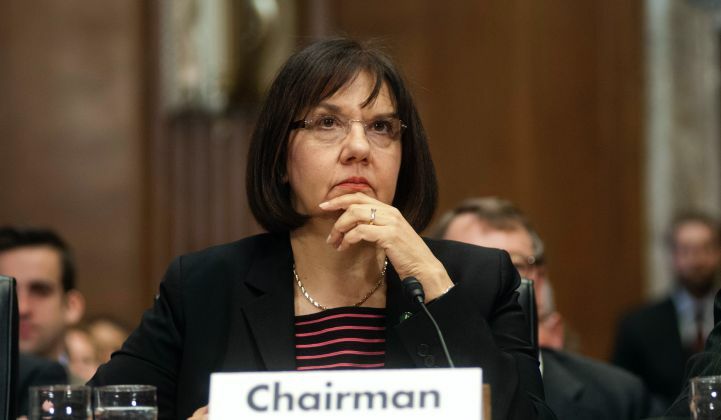 Recent news reports have named Commissioner Cheryl LaFleur as President Donald Trump’s preferred choice to replace current chairman Norman Bay as the head of FERC. According to unnamed sources, the Trump administration plans to announce the choice in the coming days, as part of a move to align FERC with the president’s energy agenda. Both LaFleur and Bay are Democrats appointed by former President Barack Obama. But industry watchers see LaFleur, a former utility executive, as more friendly to energy industry needs than Bay, who previously led FERC’s enforcement office, and has led some of the agency’s recent investigations into market manipulation by energy giants. Bay was named FERC chairman in 2015, a move that drew the ire of Senate Republicans who questioned elevating a career prosecutor to the top job. LaFleur, former executive vice president and acting CEO of National Grid USA, has been critiqued for taking the “side of the generators and the transmission owners instead of consumers,” as Tyson Slocum, energy director for consumer advocacy group Public Citizen, told Bloomberg last week. FERC regulates interstate electricity generation and transmission and natural gas pipelines, which are both touchy topics in the current political climate. Through the eight years of the Obama presidency, it has played an important role in creating regulatory constructs that have supported the development of cleaner alternatives to fossil-fuel-fired generation. Key decisions from the Obama years include FERC Order 745, which required ISOs and RTOs to pay customer-side capacity resources such as demand response an equivalent value to what power plants and other supply-side resources earn; FERC Order 755, which required ISOs to create programs to reward “fast-responding” resources such as batteries for frequency regulation; and FERC Order 1000, which has set up a new regime for transmission operators and utilities to plan for, and pay for, regional grid investments. Many of these decisions have been opposed by the fossil fuel power industry on the grounds that they opened them up to unfair market competition. One major court challenge from utility industry groups brought against FERC Order 745 went all the way to the U.S. Supreme Court, which ended up upholding the order in a 6-2 decision. That ruling reversed a lower court opinion that could have upended FERC’s authority to regulate demand response -- reducing energy use at customer sites to help balance the grid. FERC decisions like these affect the roughly 70 percent of the country served by independent system operators and regional transmission organizations that operate interstate transmission systems, making them important to how alternative grid resources and distributed energy are allowed to participate in wholesale energy markets. At the same meeting, however, FERC's three sitting members -- Bay, LaFleur and Colette Honorable -- also approved natural-gas pipelines that have been opposed by the EPA on greenhouse gas emissions grounds. Meanwhile, the Trump administration has yet to name two Republican candidates to fill out the FERC commission, which now has only three seated members . According to industry reports, potential Republican nominees include Neil Chatterjee, a longtime energy aide to Senate Majority Leader Mitch McConnell; former electric utility executive Janet Sena; Bill Marsan, executive vice president of American Transmission Co.; and energy attorneys Kenneth Minesinger and Richard Lehfeldt.